Networking. That's what we are all here to do, right? So, why is it that we frequently fail to take full advantage of resources at our disposal? Are we so busy that we cannot even think straight? (Probably!) Do we need to know what the benefits of networking are? (Maybe?) Do we know how to network? (Maybe not!) This article will hit on all of these points and offer you a "how to" guide for networking. Easy to say, not always so easy to do. The good news is, even if you have not trusted your own wisdom and judgment in the past you can learn how to do so now. No matter what business you are in or what size company, at some point you may find it overwhelming and frustrating to achieve your goals alone. Determining exactly how to proceed, or how to solve the problems that stand in the way, or how to implement the solutions can be a challenge. A Managing Business Advisor will help in all of these areas and will also provide invaluable support to keep you motivated, focused, and moving forward until the desired results are attained. 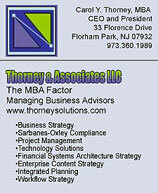 Thorney & Associates LLC is a consultancy specializing in strategy planning, design, development and delivery. Our company is based on the concept that a small group of focused, top-tier experts can deliver tremendous value and Quality Assurance to every project. We call this approach the MBA (Managing Business Advisor) Factor and define it as the need for more specialization and less generalization that illustrates the integration of all subject disciplines critical to a balanced strategy. We will guide you every step of the way through applied methodologies and processes. Thorney & Associates is pleased to offer offer a free assessment to WITI members with every contract and 5% off our rate. Legal Research Network (LRN) is in business to inspire and reinforce ethically aware, responsible conduct and set higher standards -- from the factory floor to the boardroom -- in organizations throughout the world. We enable employees to practice wrestling with legal, compliance and ethical dilemmas so they can make better decisions and take appropriate actions when they count the most. We help our customers build solutions to take on emerging business challenges, and stay ahead of rapidly evolving regulatory environments. Rather than seek to meet minimum compliance standards, our mission-based approach enlists leading companies to forge a common community standard of higher business conduct and business ethics. Search for LRN jobs on WITI4Hire. Seeking an experienced technology manager to be part of a multi-disciplinary, international team of technologist and business people developing and executing strategies targeted at virtualized platform OEMs, OSVs, and ISVs that align the company's system technologies, business, and industry investments to drive growth. A strong candidate will have a blend of technical and business education and experience, with a solid, broad-based technical background on a platform. Summer Time and the Livin' is Easy!